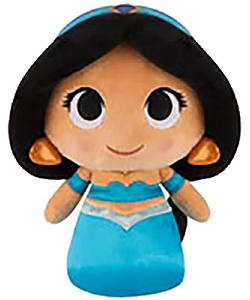 Thanks to Funko, Jasmine from Disney's Aladdin movie has been turned into an iconic SuperCute Plushies collectible character, ready to inspire you to stand up for justice. 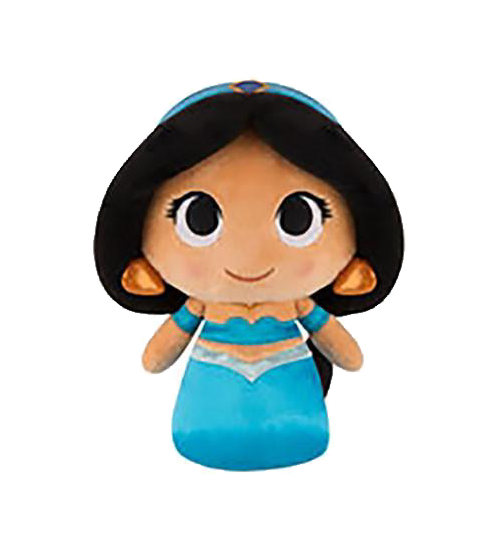 From the top of her head of soft black pony-tailed hair to the bottom of her satiny turquoise dress with light aqua trim, you will love having Princess Jasmine as a fun collectible or huggable pal. With a sweet face with blushing cheeks and embroidered independent smile and confident eyes, this Disney's Jasmine SuperCute Plushie has fun coppery earrings, embroidered necklace, and turquoise head wrap and pony tail holders, and is sure to bring fond memories and inspire imaginative play for years to come. Belle SuperCute Plushie has soft brown hair, satiny yellow dress and gloves, and sheer yellow shawl. Mulan SuperCute Plushie has soft black hair, outfit of yellow, green, navy, and burgundy, and red hair band. Pocahontas SuperCute Plushie has long soft black hair, aqua embroidered necklace, and Native American dress. Rapunzel SuperCute Plushie has soft braided yellow hair, beautiful satiny dress, and purple flower hair band. This enchanting CHARM IT! Magic Lamp charm has a shiny gold finish, dark pink glittery heart, and 3 Wishes... on the back.